The subtle yet precise upholstered lines on this seating series are defined by the shapely arms that wrap around the softly curved exterior body, enveloping the soft, inviting cushioned interior. Supported by polished stainless steel legs, Arigato is available in a multitude of configured sectionals as well as two, three, or four seat sofas and chaise lounge. Frame: Hardware and plywood frame construction with double doweled and glued joinery. Upholstery: Loose seat cushion upholstered over medium density foam and dacron with webbing and no-sag springs. Back cushions are down and feather. Legs: 1 1/4" diameter stainless steel. 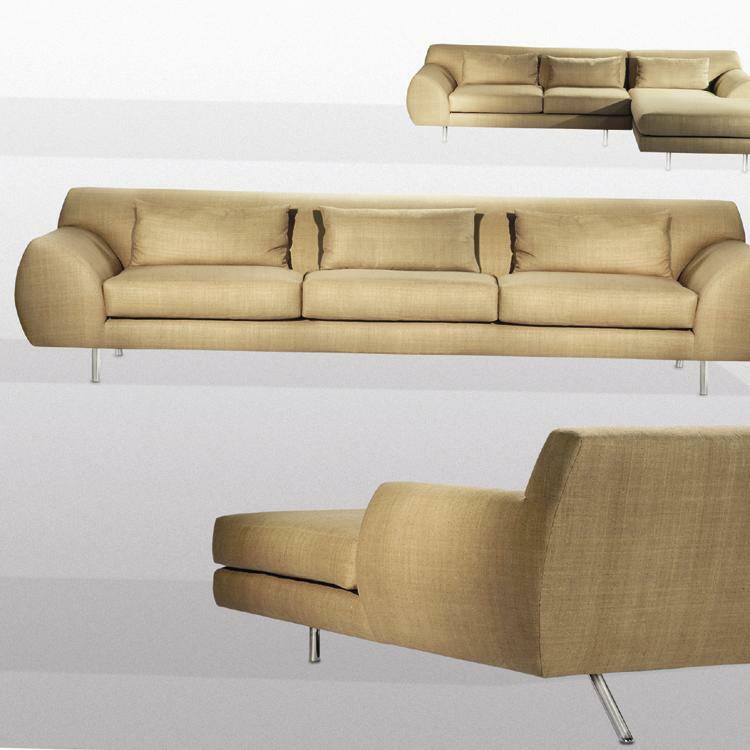 Upholstery: Available in Brueton leathers and fabrics, as well as COM or COL.
Legs: Polished or satin stainless steel.